We have 4 amazing new co-hosts this month that I am so excited to introduce you to! I have been following along with their blogs for a while and I am so excited to be working with them! They received THESE amazing benefits! And now on to this month's new co-hosts! "Hi! I’m ~dawn, from Dawn’s Disaster. I write about my everyday life, the ups and downs of being a mom, wife, daughter and sister. Blooming is one of my new favorite things to do! I love hopping around and seeing what others are able to create. Sometimes this makes me really jealous and sometimes it inspires me to try something new (like Twitter)." "Hi, my name is James and I run a little Blog called Daddy Space it’s my little corner of the World Wide Web for me and my thoughts. Blogging has become one of my favorite hobbies recently, mainly because my children bring me so much joy and I love sharing that with you. So pop on over and meet Me and my family and say hi." Meg from Happy Kids, Inc.
"I'm a Mom to three great kids (8, 6, and 4). I have a terrific husband. I have run my own business successfully for 10 years. I've always considered myself a a modern, hip, in-tune, fashionable person. My blog focused on keeping kids (and Moms!) happy healthy in every way. Topics include: healthy recipes, crafts, the arts, exercise, musings.......and martinis!" "I am a mom to a busy toddler boy and a wife to an Alaskan Fisherman. My blog is where I share the stories of our adventures." Hi! 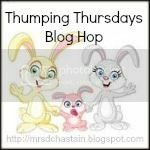 I'm new to the blog hop. I am looking forward to meeting fellow bloggers! Thank you for hosting. Thanks a lot for hosting Diana! Have a good day. Thank you so much for making me this week's "featured read"! It's my first 'featuring'. How exciting! Hi Diana! Thank you for hosting this.. it is one of my faves all week. I'm actually hosting my VERY FIRST linky party today (runs through this week!) I would love for you to check it out!